C&S readers know many things about me: I have a sweet tooth. Leonardo DiCaprio will always be my #1. I sincerely believe Meryl Streep can do no wrong. So what I'm about to write may not be the easiest thing I ever have: I did not fall head over heels for Meryl's new film "Ricki and the Flash." I was still enamored with her and her performance, of course (how does she not age? She's like friggin' John Stamos.) but the film was slightly more lackluster than what I was hoping for. I feel the glares coming at me through my computer screen, but I'll go on. Mamie and Meryl, looking (sort of) like twins. We meet Ricki and her band, the Flash, in a bar in Tarzana, where they are the house band. While they tear it up, we can tell they never had quite the star power to really make it big. Ricki, whose real name is Linda, left her husband Pete (Kevin Kline) and three kids in Indiana and set out to become a rock star. Plans didn't exactly go as expected, and she spends her offstage time working as a cashier at a Whole Foods-type grocery store. She gets a call that her oldest daughter Julie, is going through a divorce. Mamie Gummer plays Julie and is Meryl's daughter in real life. Julie is clearly devastated and looks worse than rough, but is quietly hilarious. Mamie shines more than you'd expect she would having lived in Meryl's shadow all her life. Ricki's charisma slowly helps Julie out of her depression, and there are some really beautiful moments among this broken family. We don't get nearly enough Kevin Kline, though, who charms us in the 20 minutes he has onscreen. Non-Broadway junkies will wonder who the beautiful Audra McDonald is, while fans will wish she had more than 1 scene with slightly shallow dialogue. I wanted to see more of this family dynamic, but instead Ricki returns to California and her band and Greg, her Ken Doll-looking boyfriend played by Rick Springfield. I got tired of hearing played out 80's ballads sung slightly off-key (that's the lowest insult I could possibly give her), until "Drift Away" came on. This is the best cover I've heard of this song. I remember not loving the film "Juno," also written by Diablo Cody. She and I must not jive. 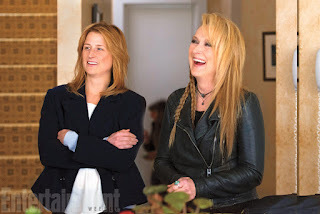 I enjoyed seeing Ricki rediscover herself as she reconnects with her family, but I think the film plateaued halfway through when she returns to California for the second half of the movie. Ok, enough Meryl bashing. She is still the Queen! But don't rush to the theatres for this one. Wait for it on HBO. Got it.